OK, this recipe is not exactly fast & easy, but it i PERFECT for a special Christmas Morning Breakfast (or for that matter, in the middle of July…or May…or September…or January). I cannot even remember where it originally came from, but it is DELICIOUS! Preheat oven to 375 degrees. In a mixing bowl, beat 1/2 cup butter at medium speed until creamy; gradually adding 1 1/4 cup sugar and beat well. Add eggs, one at a time, beating well after each addition. In a small mixing bowl, combine 2 cups flour, baking powder and salt; stir well. In a separate bowl, combine milk and water; stir well. Add flour mixture to butter mixture alternately with milk mixtue. Mix at low speed after each addition until mixture is well blended. 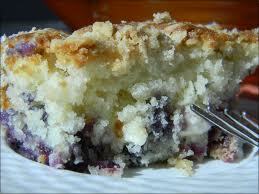 Gently fold in blueberries and cream cheese chunks. Pour batter into greased 11 x 7 baking dish. In a medium bowl, combine remaining flour, sugar, lemon zest and butter; sprinkle mixture over batter. Bake, uncovered at 375 degrees for 50-55 minutes or until golden and toothpick comes out clean. Serve warm. YUM-O! *Note: To save time on a busy morning, I measure dry ingredients into a zip lock bag, and prepare the topping mixture ahead. Keep in the fridge. Mmmm…Mmmmm….Mmmmmm… Wishing I had a piece of this to go with my coffee RIGHT NOW! Vicki: Have fresh frozen Blueberries. Going to try this next week. Tanks!!! !